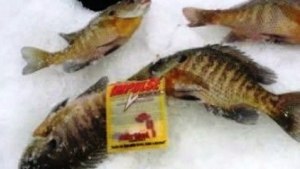 With near-record days below zero and a winter that we have not seen since the 70’s, ice fishing tactics this year will need to be adjusted during the month of March to put fish on the ice. The winter is showing that we are nearly two weeks behind to normal. The recent ‘Battle on Bago’ results should be testament enough as anglers put more burbots onto the ice and into the contest than ever before. Typically the freshwater cod is off of its spawning grounds by this time of year. Fish in general will also feel the stress of this winter soon enough if they already have not. Thick ice, coupled with snow cover on top of the lakes, causes a lot of problems. Without sunlight hitting the water under the ice, plants die. As a result, they begin to decompose. The only thing that will decompose anything is bacteria. Bacteria, like most living organisms, also need oxygen. Since bacteria typically reproduce exponentially, they quickly deplete the oxygen levels in a body of water. The fish literally suffocate to death. This is commonly called winter kill. Signs of winter kill include finding your minnows dead from fishing. If the kill is severe enough the ice itself will stink of rotting fish, and sometimes that occurs when you are drilling a hole. Taking a peek down a hole you may find the fish dead on the bottom. As bacteria get a hold of them they will begin to bloat. They will eventually break open and sink back to the bottom again. Fish will show signs of stress by becoming inactive. You may be on top of a whole school of fish that literally just sit there. I have dropped my camera on these fish and actually hit them in the head and they do not scatter. Their demise in this situation may already have been written. In many lakes the problem may be exacerbated due to the invasive species Eurasian Milfoil. More vegetation, more death, more bacteria, less oxygen, you get the picture. In addition, many of our lakes have less of a shore buffer and allow runoff into the lakes. Manicured shorelines and increased industrial farming all bring more organic matter that itself will rot. Mucky bottomed lakes increase the risk of winter kill. The good news is the weather is going to turn sooner or later. This is the time an angler needs to find fresh water dumping into the lakes, this could be an inlet or simply a hole dumping oxygenated water from the surface into the lake. Fish will naturally congregate here for a couple of reasons. First, they like the higher oxygen content. The prey of the panfish we are seeking are also looking for oxygen. This is a great time to ‘match the hatch’ and hone in on the fish. I like to have a variety of baits available. Northland Tackle has widened my arsenal with their impulse line of baits in a variety of shapes, sizes and colors that imitate prey. Knowing what is happening under the ice can adjust your approach into how you bait your hook as well as the aggressiveness of your presentation. Good luck as the hard water season comes to a close and may the rays of sunshine provide us more than a sun tan.